The boom in hydraulic fracturing (fracking) has led to an increase in the production of natural gas in the United States by about one-third since 2006. Production of has remained strong even when oil prices were low following the significant price drop in 2014. In light of the recent recovery of oil and gas prices, a 2017 report by the International Energy Agency (IEA) predicts the shale revolution to get a second wind. A number of policy makers and scientists expect increased shale gas production to both reduce gas prices and lower greenhouse gas emissions. By replacing coal in electricity generation, shale gas has already contributed substantially to the observed 11% reduction in US greenhouse gas emissions since the shale gas boom started in 2007, as documented in a recent report by the US Environmental Protection Agency (EPA). To date, countries have responded in different ways to the multi-faceted consequences associated with shale gas use, which is also feared to hurt the environment by contaminating groundwater and surface water, harming local air quality via gas leakages, triggering earthquakes, and depleting freshwater reserves. Outside of Europe, many countries with significant shale gas resources – such as Argentina, China, and Mexico – have proceeded with their plans for extraction. In Europe, the response has been more diverse. While Poland and the United Kingdom developed their first exploratory wells, Bulgaria, Czech Republic, France, and Luxembourg banned shale gas extraction using fracking. Repercussions from the Ukraine-Russia crisis, as well as renewed concerns over energy security, have led some European countries, including Germany, to reconsider their initial sceptical position towards shale gas extraction. So what if the US shale gas boom were replicated in other countries? What would be the implications on global emissions and costs to mitigate greenhouse gases if available shale gas resources were exploited in other regions as well? 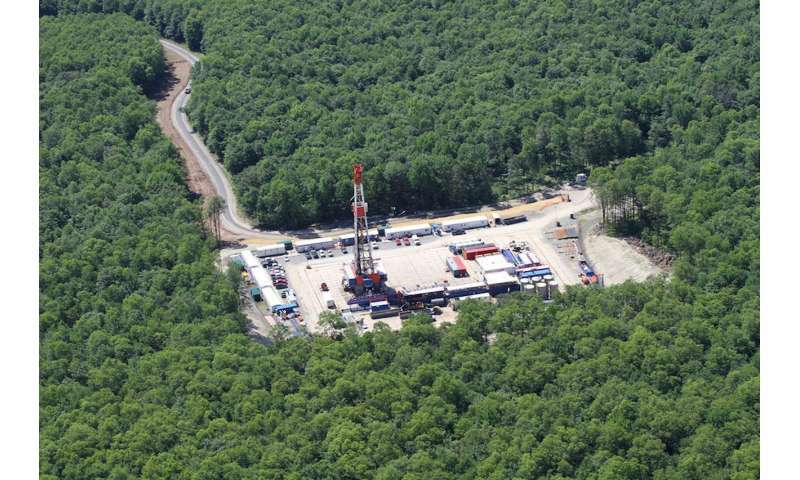 In a recent publication in the journal (Climate Policy), a French-German team of researchers from the Grenoble Ecole de Management, Fraunhofer ISI and Enerdata explored whether shale gas lowers the costs of meeting global climate targets (Umweltbundesamt), in particular to limit global mean temperature to rise by more than 2°C above pre-industrial levels agreed upon within the United Nations' climate negotiations. Their analyses, conducted on behalf of the German Federal Environmental Agency, rely on simulations with a global techno-economic model (POLES) that includes a broad variety of electricity-generation technologies and allows for a differentiated analysis of impacts for numerous countries and regions. According to the fossil-fuel substitution effect, shale gas replaces coal and oil in the energy mix, resulting in lower greenhouse gas emissions. In contrast, the low-carbon substitution effect means that – in addition to replacing conventional natural gas – shale gas crowds out technologies such as renewable energy sources and nuclear power, leading to higher greenhouse gas emissions. Finally, since energy consumption increases in response to lower prices of natural gas and other energy carriers, the demand effect causes a rise in greenhouse gas emissions. The net impact of shale gas availability depends on the relative magnitude of these three effects. The results of the model simulations suggest that in the long run (up to the year 2050), global greenhouse gas emissions would increase by about 0.8 percent if shale gas was available everywhere compared to a scenario where shale gas was exploited only in the United States. But the results also suggest differences across countries: some countries like Japan and India would experience a small decrease in emissions, while others, such as Argentina, Canada, Mexico or the Russian Federation, would face an increase in emissions of up to 3 percent in the case of Argentina. These developments also have repercussions on the costs of meeting the 2°C target. On the one hand, a higher shale gas availability tends to lower the costs of mitigating CO2 emissions per ton. On the other hand, a higher shale gas availability may also increase emissions and thus require stronger mitigation efforts to meet the given climate targets. To estimate the implications of global availability of shale gas on greenhouse gas mitigation costs, the researchers estimate the costs of additional policies that need to be implemented to meet the given climate targets for two scenarios. In one scenario, shale gas is assumed to be available in the United States only. In a second, shale gas is allowed to be exploited in all countries with a shale gas resource base. Comparing the costs of additional policies for both scenarios suggests that at the global level, availability of shale gas increases the costs of meeting the 2°C target for most countries. Yet, there are differences as well. For example, for Argentina and Mexico, global shale gas availability leads to an increase in mitigation costs of 9 percent. Mitigation costs decline for Japan and India only. These findings on the role of shale gas availability for meeting ambitious climate targets are conservative, since they did not account for fugitive emissions from shale gas production or for additional emissions from the transport of liquefied natural gas. While the magnitude of fugitive emissions is uncertain, they reduce the benefits of the lower greenhouse gas emissions of shale gas compared to other fossil fuels. If these effects were taken into account, the findings would be even more strongly against shale gas. The study's findings warrant a re-evaluation of the role of shale gas to meet climate targets in many countries. They imply that a large-scale global expansion of shale gas would increase greenhouse gas emissions and also the costs of meeting climate targets for many countries. These results cast doubt on shale gas's potential as a low-cost option for meeting ambitious global climate targets. So predicting policy and investment decisions is now a branch of science? I think not, except perhaps in Isaac Asimov novels..
Natural gas is mostly spent in various industrial processes and heating directly. It competes with eg. fuel oil, or coal in district heating especially in eastern Europe. Coal is currently cheaper. The study also neglects natural gas as a substitute for petroleum in the transportation sector. CNG/LNG cars are becoming a thing insofar as the governments allow them. Shipping is transforming from bunker oil and diesel to LPG/LNG, trucks, busses... etc.can run on cheap gas and emit less CO2 and other pollutants. Simply replacing one fossil fuel type with another does exactly zero to mitigate GHG emissions, either in terms of emissions in proportion to fuel combusted or the cost to mitigate those emissions. The only difference worth noting is the relative cost of production of the different types of fossil fuels. Which is the whole story of fossil fuels to begin with. Endless profitability, with the costs of effects mitigation shifted onto taxpayers and the Environment. Endless profitability is also the fuel which powers the "debate" over AGW. People and Corporations that receive money from their fossil-fuel investments don't want to give that money up --regardless of what kind of Hell they create for us all. "Simply replacing one fossil fuel type with another does exactly zero to mitigate GHG emissions, either in terms of emissions in proportion to fuel combusted or the cost to mitigate those emissions." Simply incorrect. Therm for therm, compared to coal, burning natural gas releases half the fossil carbon. @retro and @Caliban, @retro is right. The reason is because methane burns to two H2O and one CO2, whereas coal burns to pure CO2, and oil to a mix of H2O and CO2 with a much lower fraction than 2:1. As a result, methane and associated gases like propane and butane give more energy for less carbon (though it's not quite as good a fraction as methane for the heavier gases). In other words, using methane helps, but it's not enough. OTOH, every little bit we can squeeze is a help. You are both, of course, correct. On the other hand, let's not forget the emissions associated with the extraction, processing, and distribution of these fuels, as well, and the tendency to use more of a less expensive resource. In the end, the difference is marginal, if at all, which was the point I was attempting to so inaccurately make. Thanks for keeping the facts straight. Good on you, @Caliban. I could also have pointed out that the burning of four hydrogen atoms to two water molecules doesn't release as much energy as a single carbon atom to a CO2 molecule. Just to be complete.